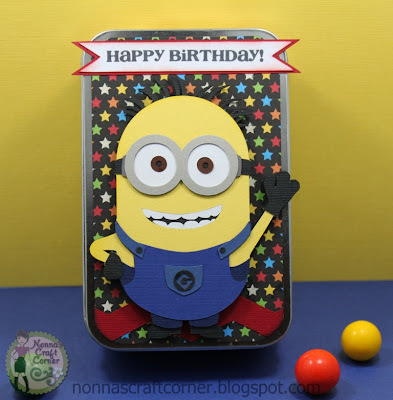 Studio 5380: Happy Birthday - Despicable Me Style! Today is Design Team Day over at Pretty Paper, Pretty Ribbons and I've got a fun birthday project to share with you. I always seem to have trouble coming up with something for the older boys in our family. The little guys are pretty easy, but the pre-teens and teens always leave me wondering what in the world to do. * I started with a little metal can that I ordered a long time ago (sorry don't remember where it came from). The can is about 3.5 X 5.5 inches. * I cut a mat from some fun star patterned paper for my background. 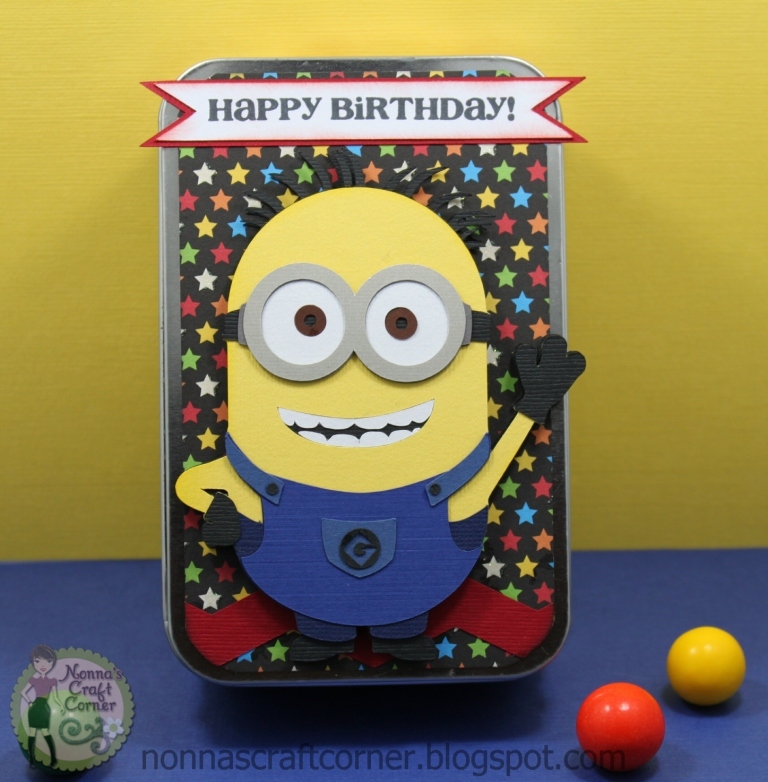 * And that fun little Minion is from the Minions Cutting Files - there are 3 Minions in the file and they are so stinkin' cute! * I added a strip of red zig-zag around the outside of the can. 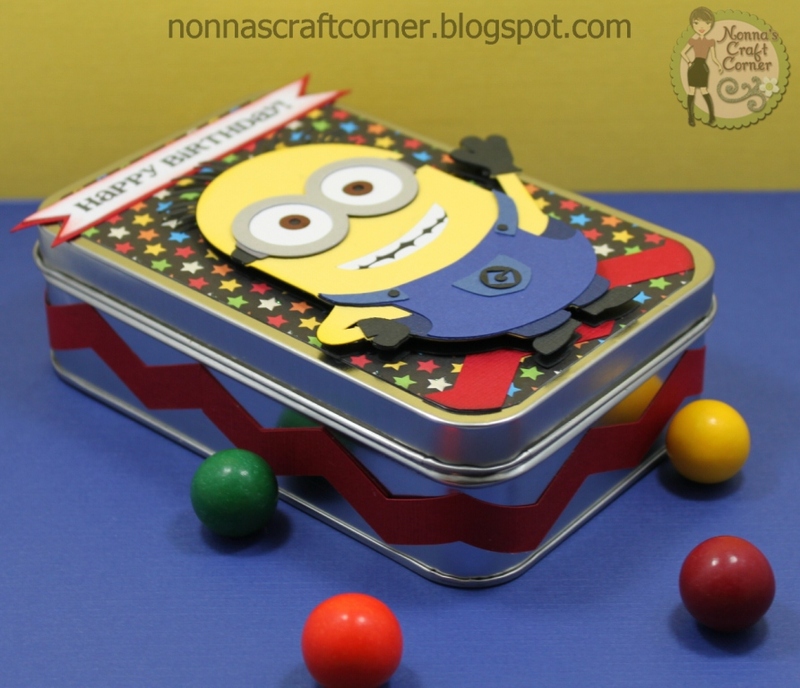 Next, I used pop-dots to adhere my Minion to the top of the can. * The Happy Birthday sentiment is from the Peachy Keen Stamp Set PKSC-04. I stamped the sentiment onto a little banner I cut using the Sentiment Spots 1 Cutting Files. And, here is my can open and filled with goodies! I thought I couldn't go wrong with the candy and cash combo! EEEK! Tanya!!! You've just given me THE best idea for my son's birthday!!! He LOVES the Minions and he LOVES sweets. Errrm, he IS going to be 40 in October!!! Ha Ha! Thanks for this amazing project which I will unashamedly nick for his birthday! Love this tin! And the Minion is wonderful and fun. Perfect! This is so super duper adorable Tanya!! What a FUN birthday gift idea!!! You ROCKED this project!!! OMG...love that little box...super cute minion!! What a cute tin. Love this project. This is so Cute. I love those minions. Now that is a great idea any kid would love!! So FUN! Love this! I have a few of those tins and this is a great idea to give candy and some money or GC!! Awesome Tanya! Thanks for the inspiration! Always a JOY to stop by! This came out too CUTE! Oh my gosh...how cute is this! The minion is adorable! It will be a big hit with the kiddo's! Cash and candy...yeah, for sure! This is adorable, Tanya. I love the Minions. 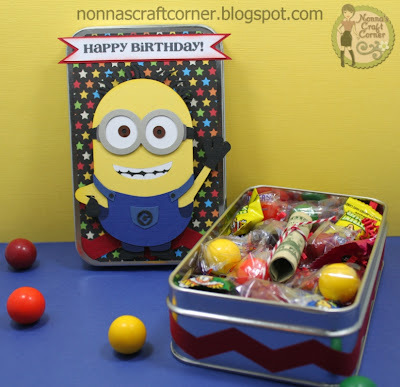 Fabulous way to dress up a treat box. Your little treat box is so cute!!! TOO STINKIN cute!! I absolutely LOVE it! That is soo cute, I love it!